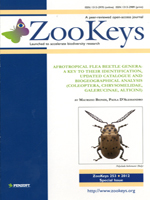 The genera of Chrysomelidae Galerucinae Alticini from the Afrotropical region are revised. The monograph includes a key for their identification, habitus photos of all genera, microscope and scanning electron micrographs of many diagnostic morphological characters and an updated annotated catalogue with biogeographical notes that including new distributional data for Sub-Saharan Africa and Madagascar. The following new synonymies are established:Aphthona Chevrolat, 1836 = Ethiopia Scherer, 1972; Sanckia Duvivier, 1891 = Eugonotes Jacoby, 1897; EurylegnaWeise, 1910a = Eurylegniella Scherer, 1972; Kimongona Bechyné, 1959a = Mesocrepis Scherer, 1963;Diphaulacosoma Jacoby, 1892a = Neoderina Bechyné, 1952; Sesquiphaera Bechyné, 1958a = ParopsidermaBechyné, 1958a; Podagrica Chevrolat, 1836 = Podagricina Csiki in Heikertinger & Csiki, 1940; Amphimela Chapuis, 1875 = Sphaerophysa Baly, 1876a. The genera Buphonella Jacoby, 1903 and Halticopsis Fairmaire, 1883 are transferred to tribe Galerucini; the genus Biodontocnema Biondi, 2000 stat. prom. is considered to be valid and reinstated at generic level. New combinations are also proposed. Finally a zoogeographical analysis of the flea beetle fauna in the Afrotropical region is provided.